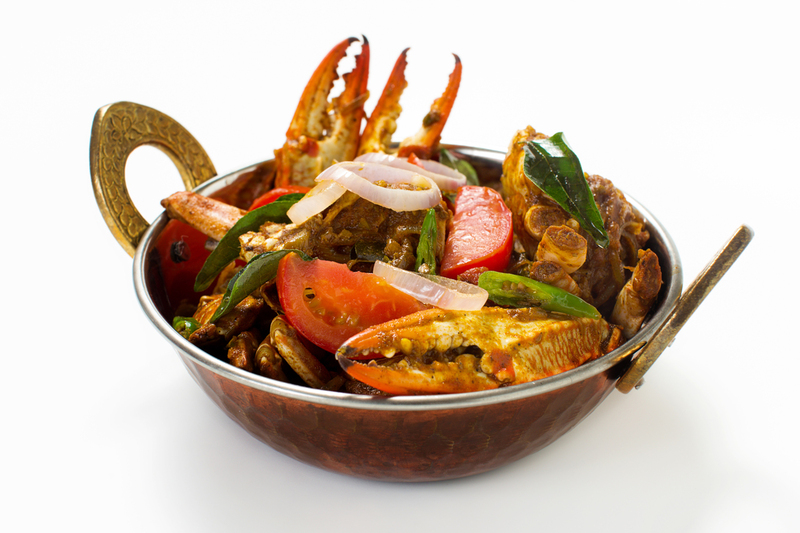 An aromatic, highly flavourful, spicy Crab Curry. Made with an easy curry base, it’s classic curry flavours lends itself to prawns and firm fish as well. An unforgettably glorious dish, best enjoyed with steamed or boiled rice and plenty of ice cold beer or water. Be warned, as claws are enthusiastically cracked, it tends to fly all over the place, creating a not so wonderful mess! Clean crabs, remove the large claws and gently crack them. This allows the flavours to permeate when cooking. Next, cut the crabs into halves. Then sprinkle the ground cumin, fennel and turmeric over the crabs. Add 2 sprigs crushed curry leaves and sprinkle with some salt. Finally mix all thoroughly and set aside at room temperature for 20-30 minutes. Heat some oil in a wok which should be large enough to allow crabs to be turned over when cooking. When the oil is hot, add mustard seeds and allow them to splutter. Turn down the heat to medium then add the onion, garlic and ginger paste. Stir continually for about 10 minutes until cooked. Mixture need not be browned but must be cooked, usually, this means the mixture has a glazed appearance. Next add the chilli paste, cook for 5 minutes, then add coriander paste. Add some more oil to prevent mixture sticking to wok. Add remaining sprig of crushed curry leaves. Cook until the oil begins to float separately. Then add the coconut milk, stirring continually until mixture begins to boil. At this point, slowly add the crabs, stir and turn through the curry. Taste gravy and add salt as required. The crabs are cooked when no blue colour is visible. Garnish as you like, e.g. some lemon wedges or coriander leaves.